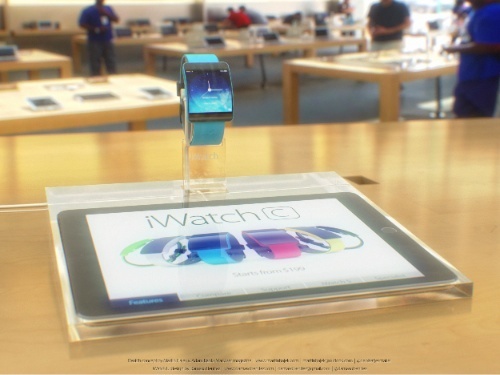 Why is Apple's iWatch guaranteed to succeed? One of the reasons can be found in Apple's recent hires. The nature of those people's professional expertise suggests that the iWatch will be orthogonal to every day technical thinking. Apple, in my opinion, is looking at 1) previously unexplored utility in wearables 2) health monitoring that makes sense and 3) fashion. The elegant combination of these elements will set the iWatch apart from geeky smartwatches that can tell us the atmospheric pressure in millbars in Hong Kong. In other words, I expect the iWatch to be a full spectrum device that does truly human, useful things and is a joy to wear and look at. There's an unexplored market for that, and it'll leave the competition gasping. Much of that will be due to the fact that Apple is using first class materials and hiring people who are experts at defining how a product is presented to the customers via marketing that creates demand. Where else can you buy a product like that? You can go into Best Buy and see all kinds of gadgets. Cameras. Routers. Disk drives. Printers. But taken in isolation, each only does one thing, and often they are a nuisance to configure, connect and keep running. They just sit there until they're asked to do a specific, dumb task. The original iPod wasn't a spectacular piece of hardware, but it was beautuful and integrated well into Apple's infrastructure. It's utility was amplified by all that it connected to so that the end result, a thousand songs in our pocket, could be achieved. It resided at the top of a pyramid of infrastructure. And so what Apple choses to display in that display, covered with sapphire, will be more than just a mishmash of disparate data. It'll be something we come to depend on. For much, much more on this, I want to direct you to an extensive discussion by Sanjiv Sathiah over at Electronista. When you've finished with "Why the Apple iWatch will succeed (Part 1)," you'll see what I mean. Next: the tech news debris for the week of Aug 4: Microsoft stuck in the mud with Windows 8.1 and Apple in full afterburner with the next iPad and iPhone. By moving to ARM, Apple could continue to increase its PC market share and scoop much of the profits — it currently rakes in about half of the money made by PC makers. And it could do this while catering to its customers in the Affordable Luxury segment who like owning both an iPad and a Mac. For example, it costs Apple US$378 for an i7 in the high end MacBook Pro. If Apple could buy ARM CPUs from itself and avoid Intel's profit taking, think how much cheaper its already awesome MacBooks would be compared to the competition. It would be one more nail in the PC coffin. On of the considerations in this (I think) is the ability to run other OSes on a ARM-powered Mac as virtual machines. If there were, say, the facility in the ARM processor to run VMs and a Roseta-like interpreter, Intel binaries could still run. How married Apple would be to this, as the PC market starts to fade, is something to ponder. Anyway, I am continuing to research this angle. Might we see ARM CPUs in our MacBooks someday? The advantages of 4K/UHDTV are not only with the viewer. From a shooting and production standpoint, there are are other advantages. 4KHUB provides some perspective via Jason DeSimone in "4K's Pros & Cons." As "film" makers decide that shooting in 4K is preferable, there will be more content, and that part of the equation will solve itself. Everything cool you could possibly want to contemplate about the iPad Air 2, as most are calling it, has been written up by Macworld UK's David Price in "iPad 6 release date, rumours, leaked images: Accessory maker's leaked photos reveal 'iPad Air 2'." Notably, Mr. Price mentions two requests made by me here at The Mac Observer. .
Everything cool you could possibly want to contemplate about the iPhone 6, as most are calling it, has been written up by Computerworld's Jonny Evans in "10 credible iPhone 6 details we heard this week." Please. Don't drool in your coffee. Meanwhile, Woody Leonhard at Infoworld rakes Microsoft over the coals for not informing its Windows 8 customers definitively what will be in the next update and then following through. The article is fairly brutal and suggests to me that Microsoft is nowhere near out of the woods yet. "It's official: Windows 8.1 Update 2 is a dud." Finally, if you've been wondering about why you see all those crazy titles for Internet articles, for example, "Reduce Your Car Insurance Payment to Zero with this One Weird Trick," this video from the Daily Show will explain everything, including how the Internet killed the newspaper. iWatch sales concept via Martin Hajek.